Donald Trump’s campaign spokeswoman Katrina Pierson says that the candidate’s proposal to ban Muslims from entering the US only applies to Muslim immigrants, not all Muslims. 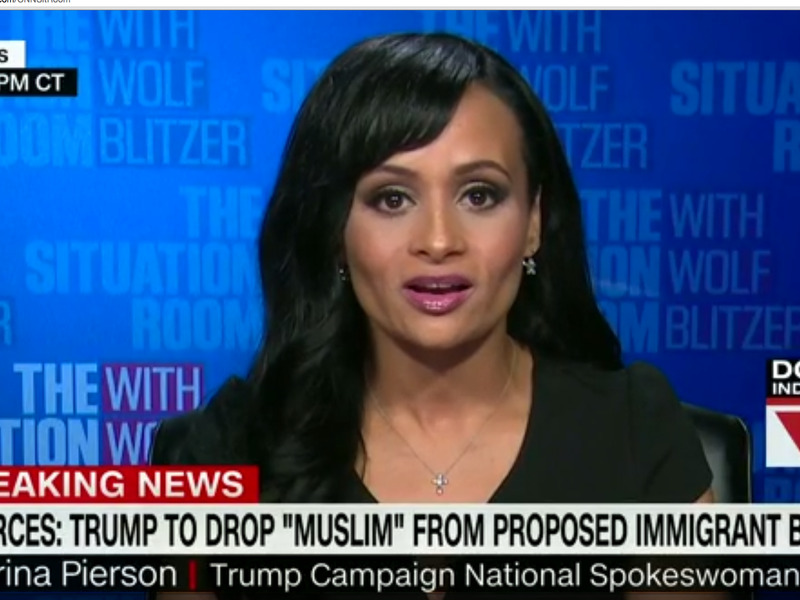 In a contentious interview with CNN’s Brianna Keilar, Pierson said that Trump’s policy hasn’t changed, and that she was only clarifying his position. Trump proposed the controversial ban five days after the San Bernardino mass shooting that killed 14 people in December. The proposal immediately received criticism from all sides of the political spectrum, and was fiercely attacked by several of Trump’s rivals during the Republican primary. Pierson argued that the proposal is meant to keep out “individuals who cannot be vetted,” and said the US does not have a vetting process in place for refugees entering the country, a claim Trump has made before. Keilar then read a PolitiFact analysis contradicting the claim. According to the analysis, the country’s vetting process has been in place for three decades, and takes more than two years for some refugees. Pierson’s comments come as Trump appears to be slowly walking back his proposal in favour of one that targets countries with a history of terrorism. But when pressed to reveal the countries Trump is targeting, Pierson declined to provide details. “Mr. Trump is going to release more specifics to answer all of your questions,” she said.